Discussion in 'PS3 Jailbreaks / CFW' started by TheSulake, Apr 15, 2019. This two options doesn't appear when I open rbgtlbx I already switched to Dex however when I was on CEX I have the same "issue?" I used to install Rebug Rex 4.84.2 then I download toolbox from Rebug website (my bad, I didn't remember the pkg which comes with the FW) btw I've installed the pkg from the web, and voila these two options missing, anyone can explain how to fix this? 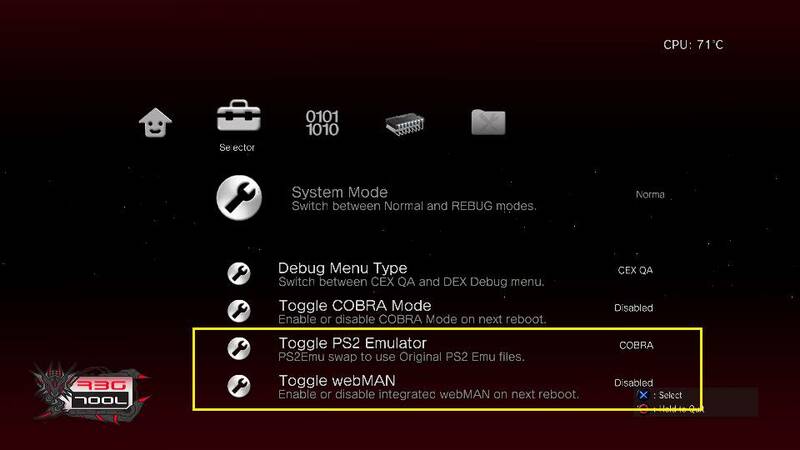 They stopped including webman w/ rebug, and the ps2 emulator is only in the FULL toolbox which is on the site as a separate package. T.A.U and pinky like this. Can't understand the part B bro, so I have to download the full version of rbgtlbx right? The second sentence is the reason why ps2 option isn't in the toolbox you currently have. This ensures you have all options available, and they will work as intended. TheSulake and T.A.U like this. Can u pm the link? to cut long story short,i've talked directly to the dev Joonie about it,you're not missing anything without original ps2emu files.basically that option is only useful if you have original full backward compatible ps3 (cecha and cechb) and don't want to use cobra for whatever reason.that means that you'll not be able to mount ps2iso's. you can via webman mod switch between ps2_emu/gx_emu (if your console supports them,ps_emu being for cecha and cechb and gx_emu being for cechc and ceche) and soft_emu (for all other models,and if you don't have cecha,cechb,cechc or ceche soft-emu is your only option anyway) on the fly.not using cobra in any scenario doesn't make sense,and enforcing soft_emu via rebug toolox is pointless also. just stick to cobra and enjoy. that's almost certainly formatting issue.you can try to change cluster size,make sure that drive has only one partition (ps3 will se only the first one) and try with prepNTFS but in my experience webman mod works with ntfs drives out of a box. ps2 and psp games need to be on internal drive.webman will see them and if selected it will try to copy them and mount after. also,sorry for my eastern european english. ps2isos only work if they are stored in /dev_hdd0, pspisos can work from /dev_hdd0 and USB devices formatted in FAT32 (not NTFS).